Mega Sale! Free Shipping Included! Save 26% on the Wii Cord Set Ac Power Supply / Av Adapter / Sensor Bar Cable Bonus Gamecube Controller by Castlelake Products at Nebula Fia. MPN: Wii-001-COM. Hurry! Limited time offer. Offer valid only while supplies last. Full set of aftermarket Nintendo Wii Cords! Easy to hook up as a replacement, or to make moving your wii to different rooms in the house easy. Full set of aftermarket Nintendo Wii Cords! 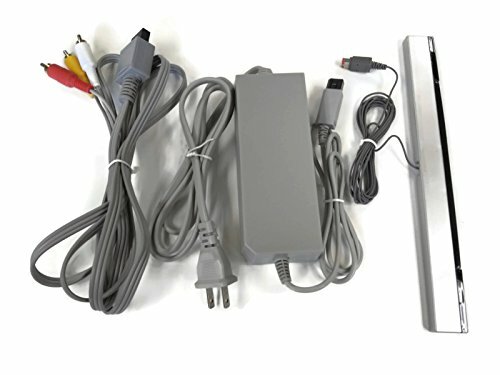 Easy to hook up as a replacement, or to make moving your wii to different rooms in the house easy. Includes Sensor Bar, Power Brick, and Audio Video Adapter. Plus a bonus Gamecube controller! Its everything you need to play all night long! Everyone loves the Wii, so grab an extra set of cords to make moving the system around a whole lot easier. Package includes: 1 Sensor Bar. 1 AC console adapter, 1 Audio Video Cord. Its everything you need to make magic happen! Includes every cord that you need to get your Nintendo Wii Console working 100%. Package Includes 1 Bonus Gamecube controller that works on your Wii System. Note that Gamecube games do work on the Wii consoles. With over 120,000,000 wii units sold worldwide, it is one of the most popular game consoles in history! Think about all the cool gadgets the wii brought us... Nintendo GameCube controller for Super Smash Bros. GameCube Adapter. Wii Remote Plus. Nunchuk controllers. Wii Pro Controller. Wii Fit with Balance Board. Wii Wheel, and endless other accessories. So many great games on the Wii. The Legend of Zelda, Super Mario, Super Smash Bros, Mario Kart 8, Kirby, Sonic, pikmin, Which one is your favorite? If you have any questions about this product by Castlelake Products, contact us by completing and submitting the form below. If you are looking for a specif part number, please include it with your message.